A top commander of the Urhobo/Isoko militant group, the Niger Delta Greenland Justice Mandate (NDGJM), has been nabbed by the operatives of the Joint Task Force (JTF) in the oil-rich region, code-named Operation Delta Safe. Security sources told THISDAY last night that the high profile suspect was apprehended on Sunday after diligent surveillance by JTF operatives. The suspect, whose name could not be ascertained at the time of this report, was said to have been arrested along with four of his foot soldiers. THISDAY learnt that the militant commander was one of the culprits behind incessant attacks on oil and gas trunk-lines in Ughelli and its environs in Delta State. It was learnt that soldiers attached to the 222 Battalion, Ughelli, stepped up a massive manhunt for the members of NDGJM since last Saturday, after the group claimed it breached the Iwhremaro trunk-line in Ughelli North Local Government Area on Friday night. “We stepped up action when the group again claimed it vandalised another pipeline and it paid off with the arrest of one of their kingpins along with four other militants,” a top security source said. It said more of such attacks would come in the days ahead, warning that it had been patient and reasonable all along, hence its decision to restrict the group’s activities to minor operations that were not aimed at causing critical damages. True to its threat, NDGJM, in less than 24 hours, claimed it attacked the trunk-line in Ughelli North prompting the military to lunch a manhunt for the culprits behind the spates of the attacks. 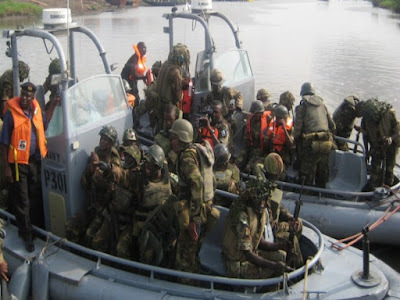 The acting JTF spokesman, Lieutenant Commander Thomas Otuji, confirmed the arrests to THISDAY monday.